Ricky Smith. left, and Dustin Adams show off their winning checks from the Ride the Bull 9 kayak fishing tournament Saturday on Grand Isle. In addition to the cash, both anglers won brand new Wilderness Systems kayaks. If you were anywhere near Grand Isle this weekend, you probably couldn’t help but notice kayaks everywhere you looked. More precisely, 628 kayak anglers were spread across the island before gathering at Bridge Side Marina Saturday morning for Ride the Bull 9, the world’s largest kayak fishing tournament. The tournament is as unique as South Louisiana: It’s a live-catch, bull redfish-only event. When anglers land a bull, an assist boat moves in to take the fish to the dock for weighing, tagging and releasing. The boats and weigh staff had their hands full, with 99 bulls weighed-in, many tipping the scales in the high 20s. It took a bull heavier than 26.5 pounds just to make it into the final Top 10. Fortunately, the anglers and bulls came out to play Saturday. Within minutes of the start, paddles were waving in the air to signal assist boats to come pick up a fish. The VHF chatter between assist boats was chaotic: Fish were being caught in every direction, and the boat captains were scrambling to pick up the reds to get them quickly to the dock. “We saw our friend Shawn (Rogers) hook-up near us and then saw bait scatter as a school of bulls came by. I hooked up and as Dustin was trying to reel in to get out of my way, he got bit, too,” Smith said. The duo successfully landed both fish and sent them off with the assist boat, not knowing for sure which one was bigger. 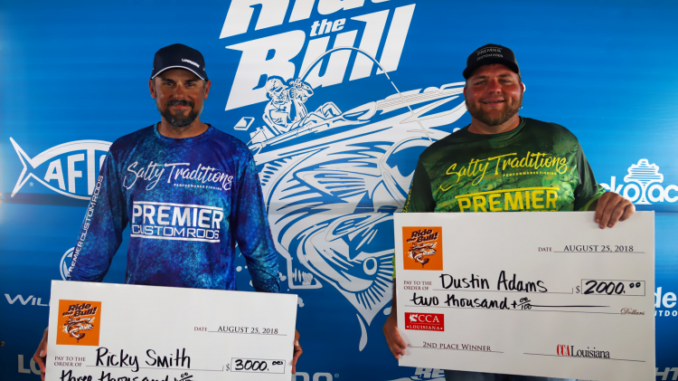 When the results were posted on the tournament’s Facebook page, Smith’s bull was in first place at 33.3 pounds, and Adams was second at 31.71 pounds. They continued to fish, but didn’t get another bite. However, their bulls held on and maintained their places on the leaderboard when fishing ended at 2 p.m.
Smith credits their success to getting old waypoints successfully transferred to a new Lowrance unit by personnel from tournament sponsor Lowrance, who were on-site for the tournament. “We were able to get to my old marked spot and that is where we stayed,” he said. As the incoming tide started to change mid-morning, the action slowed a bit, but anglers had fun battling jack crevalle, sharks, black drum, catfish and even a few large stingrays. Although none of those species were eligible for the tournament, they still provided great sport in a ‘yak. In addition to hefty cash payouts to the Top 10 winners, the top five also got to choose between five brand new kayaks provided by tournament sponsors Wilderness Systems and the Backpacker. Smith, already holding a $3,000 first place check, chose the Wilderness ATAK 120 equipped with the Helix motor drive system valued at $3,700. Adams also added to his $2,000 check by selecting the Wilderness Radar 135 with the Helix pedal drive system,valued at $2,800. However, they weren’t done yet: Both Smith and Adams were members of the Redbone Fishing Team, a group of kayak anglers that regularly fish and participate in tournaments together. Five Redbone members participated in the RTB9 Team category, winning $500 for the first place team prize. Redbone member Shawn Rogers also won fourth place in the tournament. 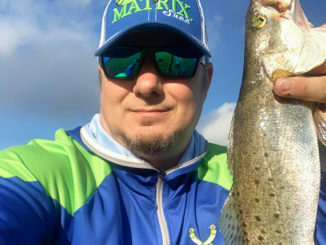 Started by Grand Isle charter captains Danny and Kristen Wray, the operation of the tournament was assumed by CCA Louisiana in 2016 following Kristen’s death from cancer. 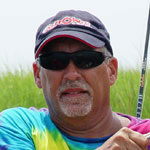 The Wray’s dream of establishing Grand Isle as a kayak fishing destination is now firmly in place. “CCA has been with us since the first event,” Danny said. “They were willing to help and were the perfect organization to ensure the continued growth and success of Ride the Bull. Next year is the 10th anniversary for Ride the Bull, and plans are already underway to make it an even more special day at Grand Isle. For more information on the tournament, check out its website or Facebook page.